Please Don't Ask Me About My Lawn! No one is allowed to talk to me about mowing their lawn this spring. No one is allowed to ask me if I’ve mowed my lawn for the first time this year or talk about mowing their lawn. And right now, I don’t even want to hear the sounds of my neighbors mowing their lawns. Why? Because, I want to mow my lawn and my lawn desperately wants and needs me to mow it. But I can’t because I took my mower to the hardware store on March 12th for the pre-season replace-sparkplug-and-air-filter-sharpen-blade-make-sure-it-is-running-top-notch tune up and they aren’t done with it yet. Admittedly, when I took the mower in, I knew they were running about 3 weeks behind, so I would not get it back until around April 2nd. However, I checked my garden records and determined that in all likelihood. I would not have to mow the lawn before then, or if I did, it would be just a few days later, no-big-deal. What? You don’t keep records of when you mow your lawn? You know, people where I work don't either, oddly enough. But I know some of you reading this do. 'Fess up! I’ve been keeping garden records 'regularly' since 2001 and I’ve often referred back to them to see when flowers bloomed, when I planted different plants, and when I’ve mowed the grass. Here’s my “first mow dates” for the past 6 years. It’s a riveting list! See? I assumed if I got my mower back by April 2nd, it would be in plenty of time and I based that assumption on six years of lawn mowing history. But I didn’t plan for this big warm-up and jump start of spring. My grass is tall, and getting taller. 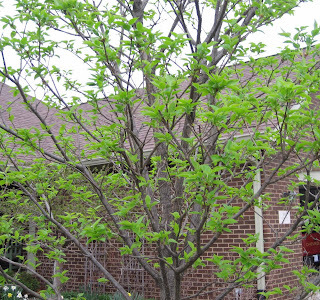 And some of the trees have really started to leaf out, like the Japanese Tree Lilac (Syringa reticulata ‘Ivory Silk’) shown above. I worked up the courage to call again today. I asked if it would be ready at the end of the week. “Perhaps”. Then I asked if it wasn’t going to be done by the end of the week, could I “furlough”it for 24 hours to cut the grass and then bring it right back and not lose my place in line? “That would be an inconvenience", they said. "We actually might have started on mowers brought on in the 11th or 12th today so you could possibly get it by the end of the week, but we can’t promise”. That’s all I have to cling to right now, that I might get my mower back by the weekend. Then I just hope it doesn’t rain. So you understand now why no one is allowed to talk to me about mowing their lawns this spring, at least not until I've mowed my lawn for the first time. And by the way, I think this lilac pictured below, Syringa vulgaris ‘White Angel’, is too far along, too. (Sorry that bud is a little blurry). I, for one, am happy that the temperatures are falling back into the normal range for a while. 50's and 60's are fine with me. Maybe it will slow some of this spring down a bit. But it won't make the grass any shorter, so please don't ask me about my lawn. I'll let you know when I'm ready to talk about it again. You have my complete sympathy. Our lawnmower broke and we can't afford to buy a new one right away. I've been scouring Craig's List for cheap ones, but they get snapped up right away. I'm going to have to borrow my neighbor's, methinks. I'm giving it another shot with a different browser (my husband's idea). Do you know anyone with goats you can borrow? Ok, maybe that's not a very practical suggestion. I am in awe of your record keeping. I wish I was that organized ... it would certainly help so I wasn't continually wondering what has happened when in past years. Sometimes I think I'm doomed to live in a veiled fog, although I continually hope that one day, I'll start taking accurate notes. The lawn is not on my list of outdoor duties, so I won't ask about it? 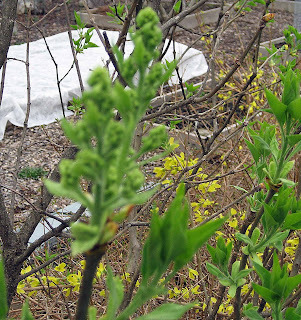 You lilac is much further along than mine - just started to see buds emerge up here, but no bracts like yours. The good thing is that you haven't resorted to breaking in and stealing your mower at night! You left it too late dear. Be prepaired! that's my motto. No wait, that's the scouts'. BTW my garden assistent had to mow the you-know-what 3 weeks ago. A record I think. Usually the mowing of the whatsit starts somewhere in April at the earliest. Oh how funny - you keep records of when you mow your lawn! If I had to do that, it would be quite depressing, since perhaps only a month goes by WITHOUT having to mow a part of mine, and most week's I mow about 30-40 minutes a day in the summertime, just to keep up. And I'm with the commentor above - if I keep planting, perhaps soon I won't have anything to mow at all! Yikes, I put off mowing as long as possible which is when the neighbors' lawn service has mowed theirs at least a couple of times and make ours looked unkempt. If they would only not have them come so early I wouldn't have to start so soon. Now our other neighbor is even worse than I am so he's the opposite problem, pretty much trashing the neighborhood with weeds especially the ones that spread like dandelion, crab grass and creeping charlie and generally keeping his grass too long so it falls over creating humps. He mows so seldomly that the grass even flowers and puts out seed stalks. I won't say a word about your lawn, but my mower's not ready yet either. And the guy is going to come and aerate in a couple of days. I doubt that he knows he'll be trying to run that machine through long prairie grass! don't you think you need a second mower for just such emergencies?